anything. Countries that are in bad trouble are probably the ones that had to cut back the most in the first place. So it’s not necessarily austerity that’s causing their problems. We find the coefficient on planned fiscal consolidation to be large, negative, and significant….Overall, depending on the forecast source and the specification, our estimation results for the unexpected output loss associated with a 1 percent of GDP fiscal consolidation are in the range of 0.4 to 1.2 percentage points. So forecasters, knowing that, say, Greece was in trouble, predicted a slowdown in growth. But the austerity program forced on the Greeks slowed them down even more. 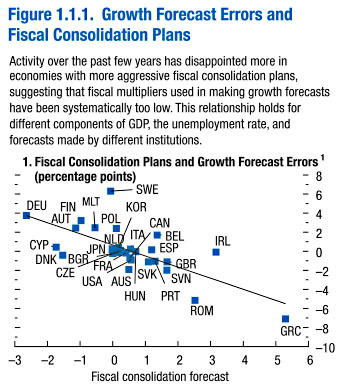 Conversely, countries like Germany, that expanded their budgets, did better than expected. Roughly speaking, it turns out that you get an output loss of 1% for every 1% of austerity. This is a clever bit of data analysis, though it shouldn’t come as a surprise to anyone. Austerity simply isn’t the answer to a severe economic downturn. It just makes things even worse than you thought they’d be.